Centre of great religious and commercial power that had it height at the end of the Early Post Classical period (900-1200 d.C) Its name signifies "The Mouth of the Cenotes of Itza" or "the Mouth of the Well of Itza", the name given to the sacred cenote. Center of religious, commercial and bureaucratic power, at its height at the end of the Early Post Classical period (900-1200 d.C.) Its name signifies "the mouth of the cenotes of Itza" or "the mouth of the Well of Itza", the name dirived from the sacred cenote. 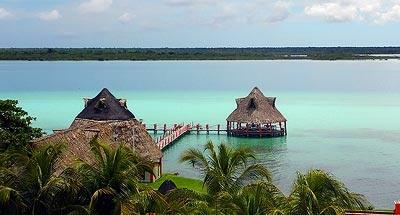 Besides being known as the last great mayan empire, it was one of the most important centers of this time period. 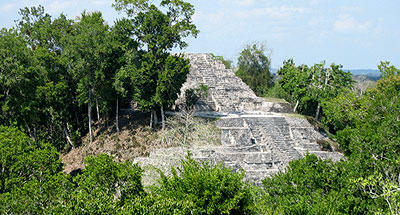 It is located 75 miles in the east of Merida, Yucutan, Mexico, and includes hundreds of structures in an area of 5 kms. The site was discovered around 435 to 455, and believed to have been occupied for 200 years and then abandoned. It is not known with certainty who the group was or what they were called, but previously the Itzaes "those who speak in faltering tongue" (a branch of the Putunes) known to be navigating intrepids and traders, dominating the area of Quintana Roo and in the year of 918 came inland to conquer Chichen, later calling it Chichen Itza. This city was at its major height in the year of 987, when its political center converted to the most powerful in the east part of the Yucatan. At the epic of its major height, the city reached approximately 25 square kms. 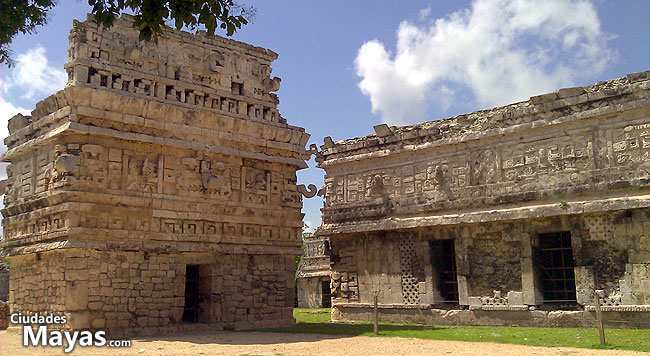 Chichen Itzá, Uxmal, Tulum y Mayapan, among others, established the League or Mayapan Confederation, also known as Multepan: a type of government that exerted power between various people. It is said that the alliance started between 987-1007 and remained until 1175-1185. 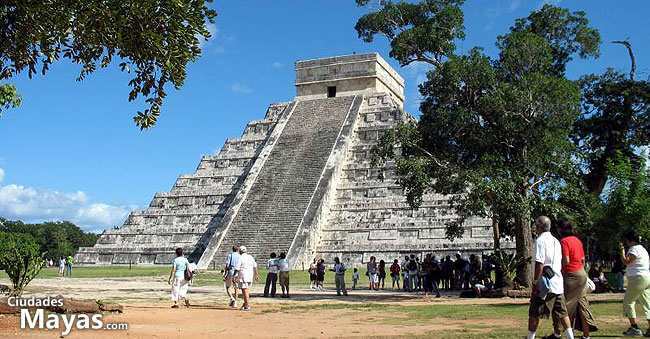 There is indication that in 1194, Chichen Itza was abandoned again, nevertheless, this city continued to be an important pilgrimage centre, due to the Sacred Cenote. The remains, although conserved, confirm the fame that the indigenous assigned to the Yucatan through their legends and chronicles. 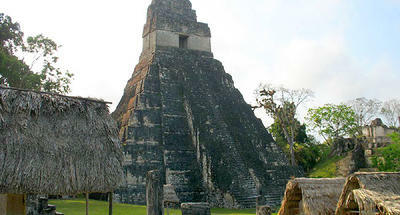 The ruins demonstrate that the traditional mayan civilization was enriched with other streams of Mesoamerican cultures. The buildings that are found distributed in various plazas, some very large, were not built to the same unity, probably because the city was constructed in different periods. 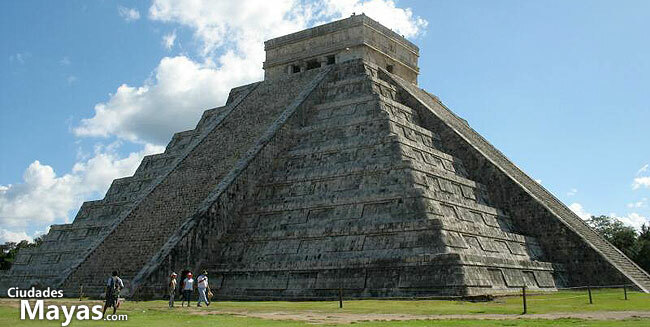 One part is actually known as Old Chichen and the other known as New Chichen. In the first part finding lots of mayan toltec type buildings, not having a chronological difference between many monuments, the monuments that stand out in this part are: pyramids crowned with temples residential type buildings basket ball court platforms used for sacred dances, saunas and the ruins of a market. 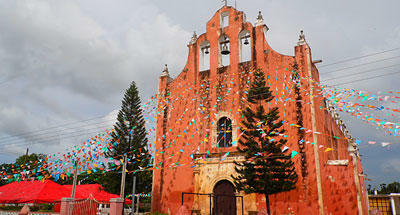 Between the buildings constructed before the arrival of the Itzaes are mentioned bellow. 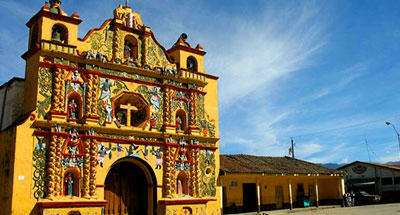 The Red House: Also known as Chichán-Chob, which means "little holes". They have still conserved the beams of the stone in all of the doors, in the patio starts the height of the vault you can observe the strip of sculpted glyphs. The House of the Nuns with it's annex: A monument with particular characteristics, measures 70 by 35 meters wide and 18 high, the original temple has murals with Greek stairs and sculpted dice with floral elements, the doors also have been conserved with beams and glyphs. The annex possess a decoration that corresponds with two different styles, one similar to the Uxmal style lattice window and the other remembered by the style Chenes. The Church: It is named because of it's proximity to the House of the Nuns, located to the southeast, it is a building full of decoration. 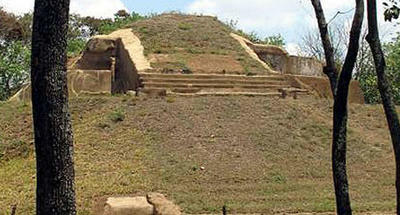 The observatory: Also known as El Caracol, is considered a intermediate work, that has maya and toltec elements. It is a building with a circular tower in the center, the first part of the tower is solid, then exist an intermediate part with a shell ladder and a central nucleus, at the end there is a superior room where one can observe the movement of space, also here appear small openings directed at the cardinal points and astronomical points of importance. Additionally to the ones already mentioned, you will also find La Casa del Venado (The house of the deer), the Akabdzib and the temple of the sculpted tables. 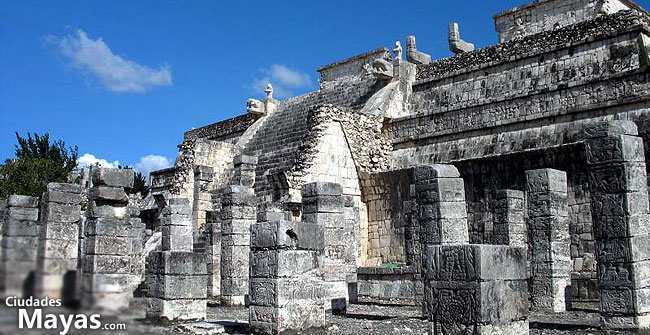 The constructions are done in the traditional Mayan style, they do not show square plans or forming of an acropolis like is seen in the centers of Piedras Negras and Uxmal. The Putunes or Toltecs brought different elements, we will name the following: patios and galleries of pillars and columns, covered with beams of wood ( consisting of a new type of building that permits large interior roof spaces, something that is not possible with Mayan system of projecting vaults that could only be made smaller because they are made of stone), columns in the shape of feathered snakes, human sculptures, reclining sculptures, intertwined snakes, representation of tigers and eagles that eats heart, pillars decorated with sculptures of fighters. The Castle: A large pyramid building 24 meters tall and 60 meters wide at the base. It is constituted by nine bodies with ladders in it's four ornamented sides. The Ball Game: It is the largest court in Mesoamerica, l68 meters long, the height of the side walls are limited, and they are embedded rings of rock relief of intertwined snakes and en the extremes of the small temples. At the side of the walls there are stretched benches of rock. From one extreme of the field (to the left backside of the photo) you can find a wall from which is experimented with clarity of the Echo-effect, where the guides bring together the tourist to clap or shout a word in unison, which travels for the whole ball fields until it bounces back to the front wall and returns. 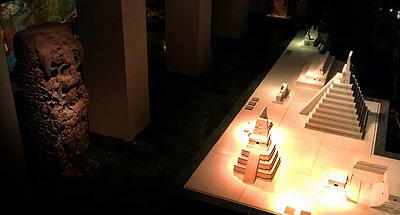 Platform of skulls or Tzompantli: Platform in the shape of the a T that measure 60 meters long and 12 meters wide. Here you can find rows of skeletons put in stacks, carved in relief around the structure this also appear eagles and fighters with human heads in there hands. Platform of Venus: To the north of The Castle, es a platform of 4 meters high with steps in each part of the sides. It has tucked panels where he represented the man-bird-serpent, symbol of Quetzalcoatl-Kukulkan. On the other side is bound and signs of the planet Venus, apparently referring to the simultaneous initiation ofthe solar calendar and Venus cycle. Tigers and Eagles Platform: similar to the previous construction, has a homeboard where there are groups of jaguars devouring onslaught heart sand protruding parts of the board, eagles are also supplied with these bodies. The Temple of the Warriors: Also known as the Group of the Thousand Columns, by rows of columns and pillars that owns the temple in front and one side of it. The temple consists of two large rooms and in the entrance are two pillars with beautiful serpent heads of snakes on the ground and rattlesnake tails in the upper parts. 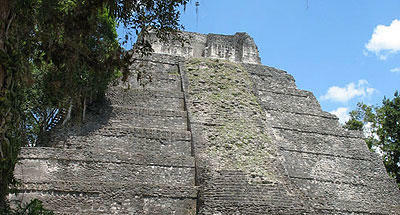 The walls of the temple are sculptures of Mayan and Toltec theme. Sacred Well: To reach it, there is a paved road coming from the north side of the square, the cenote is a well square diameter between 50 and 60 meters with a depth of 22 meters at the edge are the remains unearthed of a building with a steam room, plus here are taken from many objects that have stood the test of time and the action of water, such as jade, gold, ceramics and textiles, wood, resin and rubber, the latter being kept due to lack of oxygen in the water of the cenote. Also many human remains have been removed, both children and adults, as was common to throw the sacrifice of the victims within its waters. Besides these buildings, they have identified another as the ossuary, which happen to be quite destroyed, under the same well a cave is located leading to irregularly shaped 12 meters high, which human remains have been found, also offerings of jade, shell and rock crystal and copper bells. The construction corresponds to the late period and are in this foreign influences. Your access is via Federal Highway 180,about 120 kms. 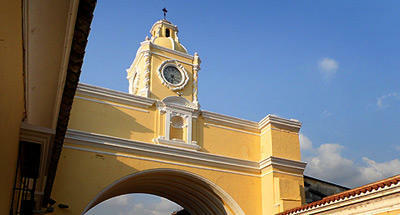 From the city of Merida. 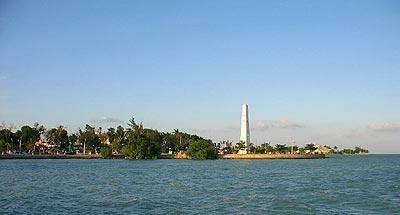 The trip can be done either by car or public bus service traveling to the site every hour. The site can be visited in a day, but if you want you can rest in it, it offers accommodation services (hotels and villas close to the site), museum and custodians.